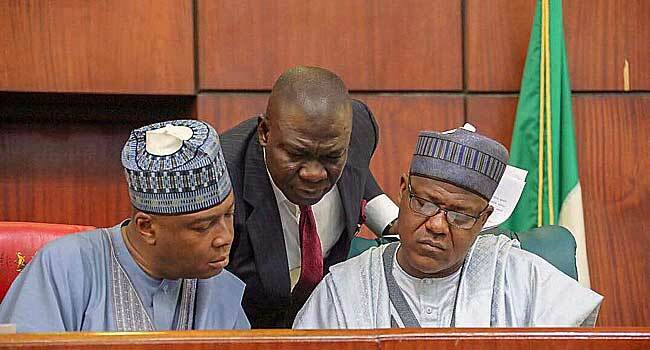 Senate President Bukola Saraki, Deputy Senate President Ike Ekweremadu, and Speaker House of Representatives, Yakubu Dogara, during a joint session of the National Assembly on Tuesday, June 5, 2018. The National Assembly has reaffirmed its vote of no confidence on the Inspector-General of Police (IGP), Ibrahim Idris, and warned the President over the “systematic harassment and humiliation by the Executive of perceived political opponents”. These were part of the resolutions of the lawmakers after an emergency joint session which was held behind closed doors on Tuesday. The resolutions were read by Senate President Bukola Saraki. “We also hereby reaffirm our earlier resolution on the vote of no confidence on the Inspector General of Police, who does nothing but preside over innocent Nigerians with an outright disregard for the constitutional authority of both the executive and the legislature,” Saraki said. The Senate had earlier in May 2018 declared the IGP as an ‘enemy of democracy’ and unfit to hold a public office after the police boss refused to appear in person before the lawmakers. Tuesday’s emergency joint session comes amid renewed friction between the legislative and executive arms of government. The friction had been ascerbated by the refusal of the dispute between the lawmakers and the police boss, the travails of Senator Dino Melaye with the police and the recent invitation of the Senate President over his alleged indictment by the Offa bank robbery suspects. During the joint session, the lawmakers demanded an end to the persecution of perceived enemies and vowed to go tougher in checking the powers of the President. “The systematic harassment and humiliation by the Executive of perceived political opponents, people with contrary opinions including Legislators and Judiciary by the police and other security agencies must stop,” one of the resolutions read. They also resolved that President Muhammadu Buhari is accountable for the actions of his appointees. “The President must be held accountable for the actions of his appointees and must be ready to sanction those that carry out any act which will ridicule or endanger our country and democracy,” read another the resolution. The killings which have claimed the lives of hundreds of Nigerians in 2018 alone were also a source of concern for the lawmakers. And they believe that the security agencies must come up with an answer to them. “The Security Agencies must be given marching orders to curtail the sustained killings of Nigerians across the country and protect life and properties of Nigerians as this is the primary duty of any responsible Government,” the lawmakers said. Weeks after the lawmakers passed a vote of no confidence, separately, on the IGP and called for his removal, the IGP has remained in office. With Tuesday’s resolutions, they expect action to be taken. Should nothing be done, they vowed to take tough actions of their own. “The National Assembly will not hesitate to evoke its Constitutional powers if nothing is done to address the above resolutions passed today,” they warned without giving futher details about the powers.